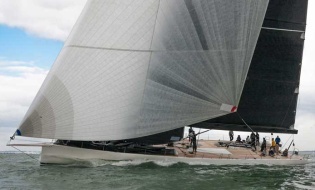 Pershing continues to accelerate on the course of innovation and contemporary aesthetics. Like its predecessor 9X, the new 8X is made of the same material that the most advanced nautical dreams are made of: carbon fibre. This material not only means lighter weight, greater speed, and lower fuel consumption, but also more volume due to the ability to design larger, more comfortable spaces. The on-board comfort is extraordinary, thanks to the many benefits offered by the new system that integrates propulsion control with the manoeuvring, navigation, and monitoring systems. With the new 8X, “piloting” a Pershing, even at high speeds and without the support of the captain, is fun and accessible. EXTERIORS The aft swimming platform leads to the garage that can hold one Williams Sportjet 345 jet tender and one jet ski. 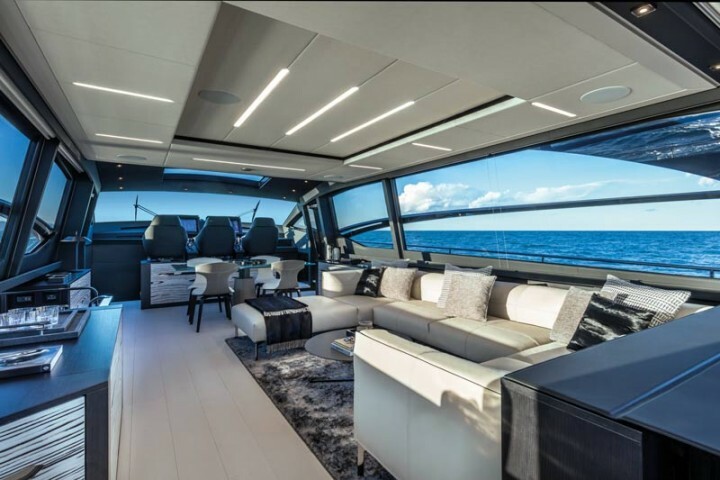 Stepping up to the cockpit, it overlooks an area with a sunpad and opposite a dinette with a sofa and a coffee table that can be electrically lowered on request to create a second relaxation space. 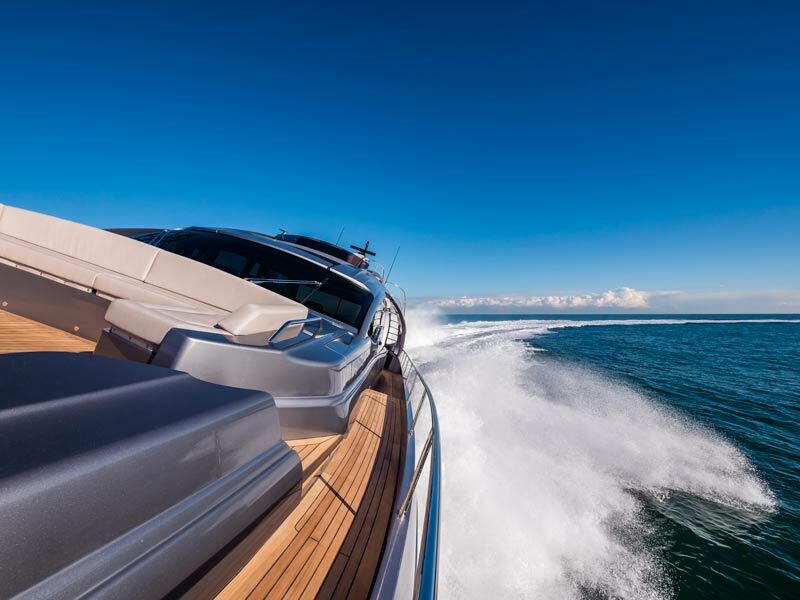 On the port side, Pershing introduces the first distinctive and characterizing innovation of the new 8X: the stairway giving access to the sundeck is integrated in the characteristic Pershing side wing, which thus becomes a functional as well as an aesthetic element. Composed of black painted steel steps covered in teak, framed by a carbon fibre upright and two lifelines, this new solution not only highlights the clean style but above all allows the owner to dedicate more space to convivial life in the spacious 22 m2 cockpit as well as on the sundeck. The mobile grill and sink are situated to starboard, while lockers and storage compartments are positioned on both bulwarks. The other exterior zones are also exceptional in terms of aesthetics and functionality. A large area forward holds a separate sofa and sunpad. Optionally, the terminal part of the sunpad can be turned into another sofa opposite, creating a compact dinette. The sundeck measuring approximately 15m2, free from stairs from the cockpit, offers generous spaces for relaxation thanks to a large 5 m2 sunpad opposite a sofa. The helm station is equipped with retractable screen, and all the exterior areas can be protected by biminis and sun canopies. The glass door onto the lounge transforms the main deck into a large open space of some 50m2. Bathed in natural light, the main deck is organized into 3 separate spaces: lounge, dining area, and helm station. The double-side access, via two doors at the helm station, enables the proper distribution of flows with separation of the areas, offering the owner and his guests the maximum intimacy and privacy. In the lounge, a large C-shaped sofa with chaise longue is situated on the starboard bulwark, with the TV opposite integrated into the cabinet, which opens with a sliding and rotating mechanism. The dining area features a table for eight and low cabinetry on the two bulwarks. 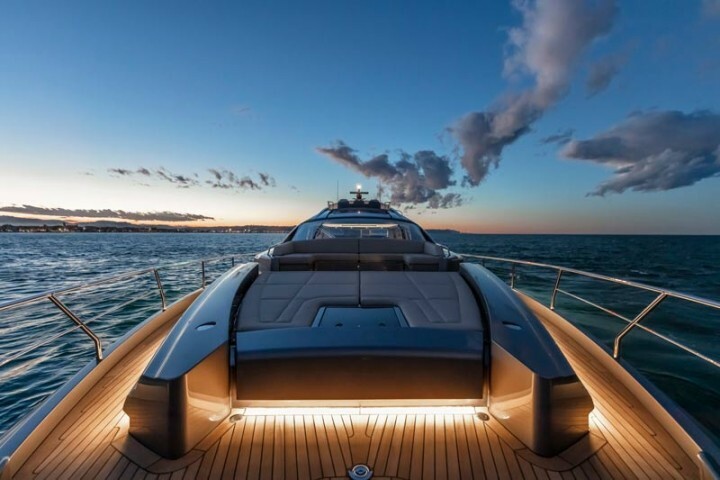 Beyond this area, the helm station, magnificent in its form and practicality of use, is a masterpiece of design, surprising in its elegance, technology, and sportiness. Co-designed with Poltrona Frau and upholstered in “Interior in Motion” leather, it is comprised of three independent chairs, an integrated bridge, and a windshield with no uprights, even larger, created using an innovative technology of glass tempering, providing total visibility. A large dark glass sliding roof above the control station further accentuates the sporty nature of the 8X. The integration of the control and interface between engines and drives is supported by a platform jointly developed by Top System with Onyx for the EasySet system and Xenta Systems for the advanced electro- hydraulic steer by wire system, supported by the Naviop-Simrad LOOP for the navigation and monitoring systems. All this is integrated and accessible to the pilot via large natural carbon panels and touchscreen monitors up to 24”, framed in Poltrona Frau leather. 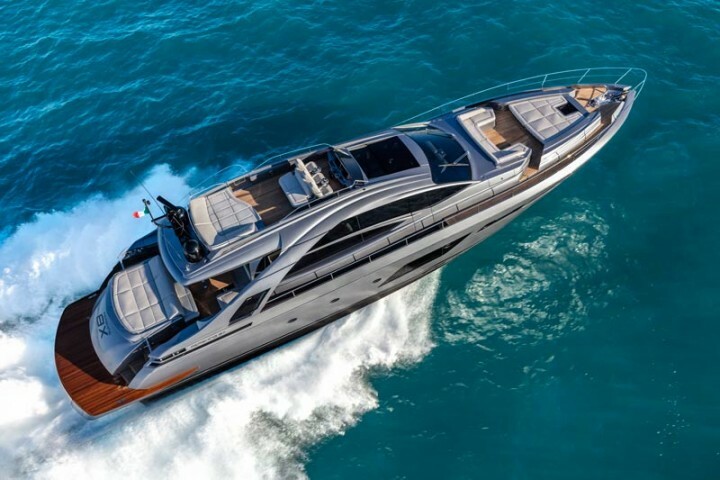 On request, the owner can install the propulsion package resulting from the longstanding partnership between Pershing and Top System, which offers a new version of the EasySet system that stems from the experience developed on-board the latest Pershing models, optimizing trim and performance during navigation, although it can be bypassed at any time in favour of manual control by the captain.